CBOT board is covered in red this morning after a weekend of showers in the Central/Eastern Corn Belt. Markets opened lower across the board in corn, beans and wheat and have not traded higher since. The areas hit with rain were in decent shape already but we did see some welcome moisture for some of the areas I mentioned last week in NW Iowa that needed it. Bearish seasonal trends combined with a week of cooler weather ahead has the market on the defensive. The massive amount of old crop corn destined to move by the end of August weighs on the corn market like an albatross. Forward forecasts remain dry but at this moment the market cares little given a rush to liquidate. There are fresh new gaps in all of the grain charts, I expect the markets to bounce at some point here over the next week given the outlook for drops in condition ratings and a continued arid forecast to cover those. 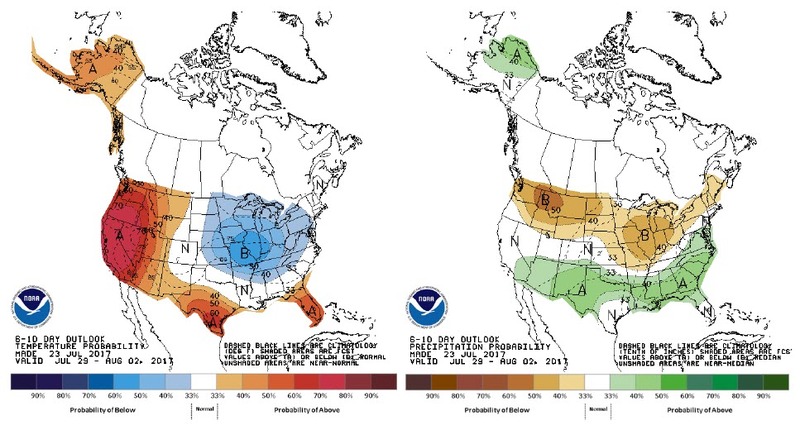 How much more upside from there will depend on the weather the next two weeks. Here is what it looks like right now. Cotton market focus is going to shift back to new crop production today with crop progress out at 3 pm central. The forecasts are pointing toward rain in the 5 day forecasts. If the market looks to trade from the supply side, I think we should see weaker prices in the shorter run. Cotton Association of India is projecting cotton production to increase by 12% next year (they had a poor year last year) which should curb some US export demand. Right now old crop US export pace is above 100%, we should see a demand hike in the coming days. I see little that breaks us out of the 65-70 cent range for the time being unless the outlook for the US and Indian crops continue to rise. I would be a buyer on breaks below 65 in December and a seller above 70 cents, all the way up to 72 cents. COT reports from Friday (as of Tuesday’s close) showed a long position of almost 100 k contracts, which was the longest we have seen this market since the February run up. Wheat and soybeans have net long positions as well, in the case of wheat this is probably bearish fuel given the price action while in soybeans a net neutral position is not given the fund appetite for soybean length at this time of the year. The net cotton position is back to near 20 k long, a place where I would be very comfortable taking a long position. It will be a busy week ahead in the macro markets with the US dollar approaching multi month lows and the Federal Reserve set to meet on Tuesday/Wednesday followed by GDP data on Friday. We also have a crop tour in the Dakota’s wrapping up this week. I do not encourage producers to establish new short positions at these levels. I feel there is another run in this market given the dry outlook and the weak dollar. Producers who moved bushels in recent weeks should be looking to price re ownership strategies off breaks in the carry. Meaning, if you sold 4.00 Dec futures last week, look to re-own March or May at that level. The same strategy applies in Wheat. If you rolled calls from Aug to Sep, keep that exposure where it lies.